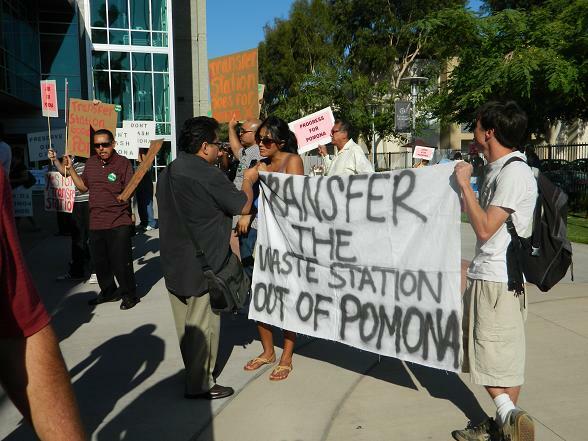 POMONA, California - A city council meeting to decide the fate of a proposed waste transfer station in the city's impoverished east end became contentious as various factions interacted at a pre-meeting rally. After a long corporate presentation and an even longer public comment period, the council voted against the vast majority of the community to approve the project. Protest, including some shoving involving police, ensued. Valley Vista, the company proposing the project, has had its eye on Pomona for over ten years now, during which time it has been making financial contributions to politicians and non-profits, halting political payouts (except to the mayor) just in time for the councilmembers to be able to legally (but not ethically) vote on the project. Upon its initial proposal about two years ago, Valley Vista sought just over ten acres on which to build a regional "transfer station" that would sort garbage from 11 area cities before shipping it to landfills and other destinations. Of course, the plan provoked consternation among residents, who already suffer from high rates of police violence, poverty, and environmental racism. One LA, apparently having come accepted that the station was a foregone conclusion, came up with a set of demands on the company rather than organizing to prevent the establishment of the station in the city outright. These included demands addressing environmental concerns, such as the demand that the station be served by no diesel-fueled trucks, that the facility not include a diesel fueling station, and for a reduction in the tonnage of waste processed there. Some, on the other hand, were just self-serving, including the demand that Valley Vista fund a "clean and green" non-profit that would be managed by a board composed of One LA members. 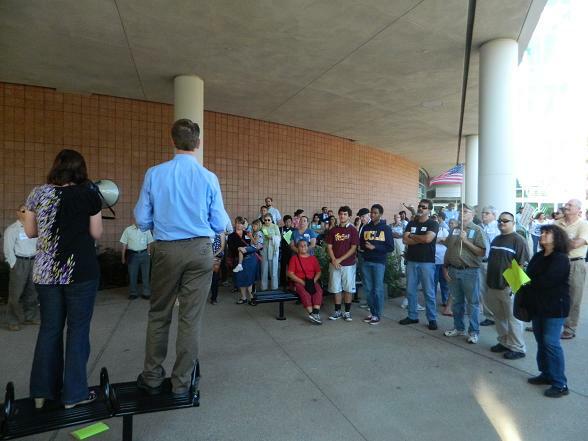 One LA scheduled a rally just prior to the meeting and mobilized a fair number of people from its member institutions, which consist of a few, mostly white Protestant churches in the Pomona and Claremont area, a heavily-Latino Catholic church, and the Associated Pomona Teachers. While the public messaging about the rally continued to be "stop the 9th street transfer station" on facebook and elsewhere,3 One LA was prepared to support the project if its demands were met. And in negotiations between a select group of individuals from the member congregations, the deal was all but guaranteed. 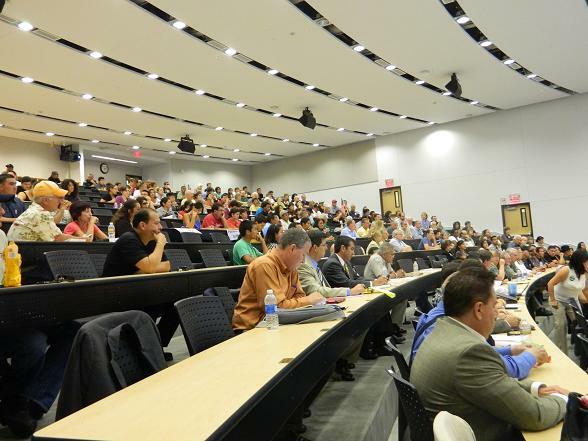 However, just prior to the meeting, which was held in a large lecture hall at Western University downtown (which was controversial in itself due to Western's stated support for the project), word got out about the secret negotiation. Other groups also showed up to rally, although with their own causes. Valley Vista brought its own supporters, who wore green buttons reading "Jobs for Pomona" and carried picket signs bearing supportive messages. Most, if not all, were employees from other Valley Vista operations. Activists affiliated with Pomona Habla, a community coalition that has focused primarily on the checkpoint and vehicle impound issues that disproportionately affect the undocumented population, generally oppose the project, but rallied in support of a popular referendum to allow the people decide whether they wanted the station or not. A similar referendum was held about six years ago and shot down the idea. But the most vociferous group was an autonomous group of Pomona youth, who were livid not only about the trash, but also about One LA's exclusive negotiations. Other unaffiliated community members gravitated toward this group. They carried signs that read "One LA doesn't speak for me!" and chanted "No transfer station! No negotiation!" Their chants drowned out One LA's amplified speeches, and some One LA members became very defensive in the face of the criticism. Things heated up as the time for the meeting approached, but calmed again as the 400-some interested folks filed into the hall. 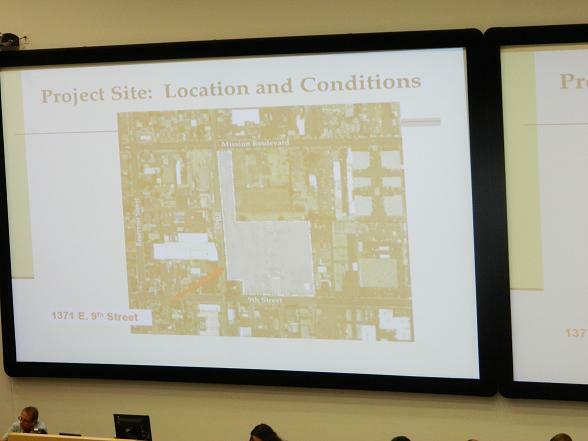 Following strict admonitions against cell phone usage, applauding, booing, and other uncontrolled forms of participation, the first item on the agenda was a lengthy presentation from Valley vista detailing the project. 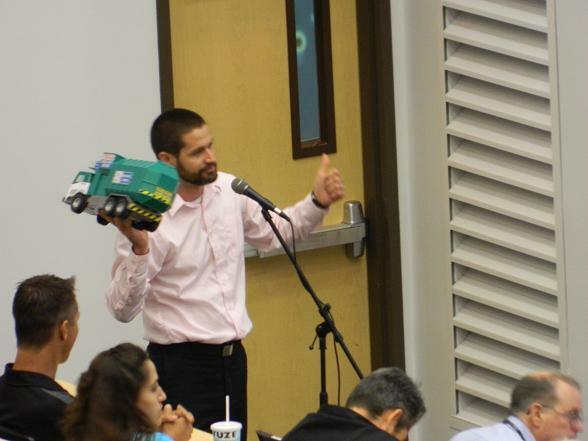 After the presentation, councilmember Freddie Rodriguez asked how much the city was going to be receiving from the company for upkeep to roads resulting from the increased traffic by the garbage trucks, and learned that the figure was one million dollars. The estimated cost of the repairs, he learned on further inquiry, was between three and five million. The presentation was followed by the public comment period, which was divided between supporters and opponents. David Perez and his attorney spoke first. In his comments, Perez discussed some of the amendments the company had made to the application based on the negotiations with One LA. Most of the project supporters came from Pomona's business community, including the chamber of commerce and the Downtown Owners Association. Some, however, came from the non-profit sector. The Boys and Girls Club, for example, registered its support for Valley Vista. It has received financial contributions from the business4 and David Perez is president of the executive committee of its board of directors.5 Their comments took about a half hour. Next followed the comments of the opponents, which grouped One LA members with the other opponents of the project. The impassioned speeches were based on intensive research, concern for the youth, and especially, fear of the environmental impact of the plant. Leaders from One LA did their best to register conditional support, but for the most part, their comments ended up sounding neutral. Their rank-and-file members gave speeches that were not as carefully-aligned with the official message of the organization, and which made many good points. 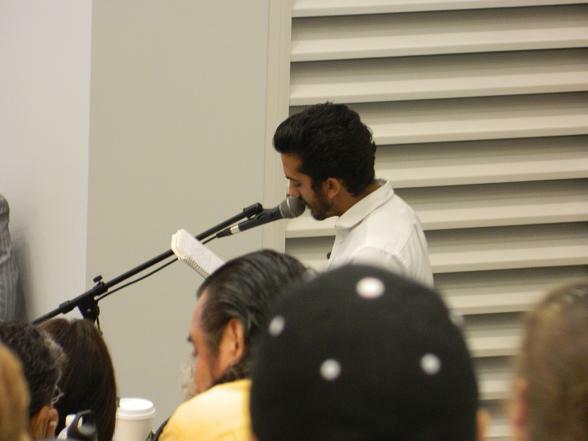 Other speakers included a man who spoke in Spanish about his opposition to the plant, and who has been turning in signed petitions at every public meeting on the topic. On Monday he turned in another 600-odd signatures, bringing his total to about 6,000. Another resident took advantage of the presence of the president of Western University to denounce the planned clearing of several magnolia and jacaranda trees from Western's parking lots to make way for a housing project. She spoke against the station, and used the final moments of her comments to bring attention to Perez's resignation from the mayorship of the City of Industry, the only speaker to do so. One young artist recommended that instead of a waste transfer station, that the city instead install an eco-friendly composting facility. Jim Sanbrano, the attorney with the Pomona Habla coalition, brought up the potential illegality of One LA's negotiations, citing a ruling that found that such talks must be held in public. One man spoke of the danger to the water table beneath the city. Many questioned One LA's authority to negotiate on behalf of the entire city. Wary of the police presence to enforce the "no applause" ban, numerous participants, especially the youth, "twinkled" their fingers in support of comments they agered with in the manner of occupy. In total, over an hour's worth of public commentary critical of the proposal was given and heard by the majority of the council. Among those not listening were the mayor, who had recused himself from the hearing for having received campaign contributions from the company, and councilmember Ginna Escobar, who was too busy texting, fixing her hair, and otherwise disengaging from the process. Perez and his attorney took more than their allotted time of five minutes to theatrically rebut their critics, and then the council launched into discussions. 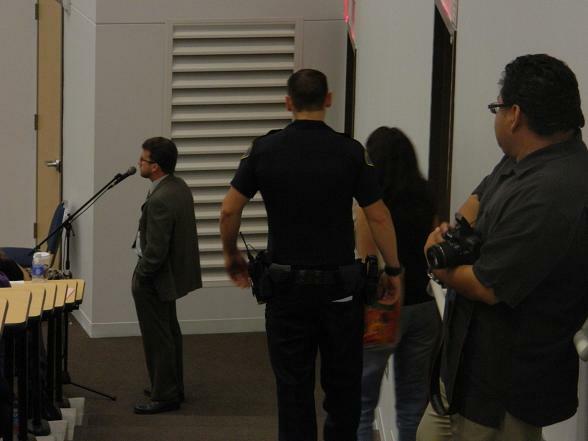 During the discussions, an audience member who is a well-respected writer and a mentor to many of the area DREAMers, asked about the water issue and was promptly ejected from the meeting by the police. Councilmember Cristina Carrizosa questioned the last-minute changes to the proposal based on One LA's negotiations. "Why are these changes being made now? We have been relying on documentation detailing a prior version of this project, and are not in a position to make a decision without the chance to analyze the changes." She made a motion to subject the proposal to a popular vote. The air became tense as the room waited for someone to second, which would have allowed the motion to go forward. None came. As the moderator moved to the next point, one young man shouted out "Shame on you! Shame on you!" Police quickly moved in to silence and eject him, but he left voluntarily. He inspired others to do the same. "If you kick him out, you'd better kick me out too!" "This is not democracy!" and further shouts of "Shame!" 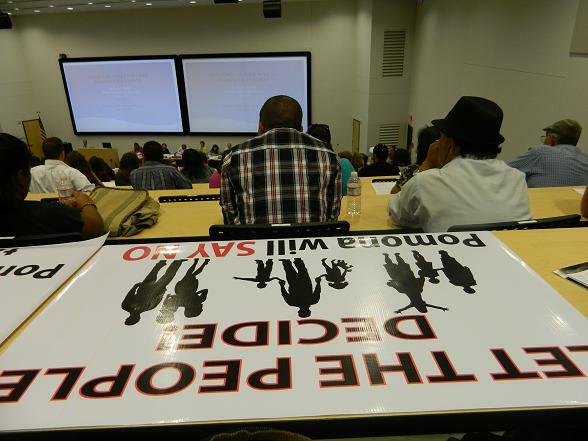 were heard as a large contingent of angry residents exited the lecture hall. Discussions of voting the council out of office gave way to chants of "November will smell like trash!" from outside the hall. Police began herding protesters out of the hallways, using force at times. One elderly man took a spill on the steps from the force. The crowd regained composure and began quietly discussing the issue when police approached and informed the group that it had to leave the premises. The administration of private university had ordered their removal, calling into question yet again the council's choice of location for the "public" meeting. As midnight neared, the council finally took their votes. Carrizosa and Rodriguez voted to oppose certification of the environmental impact report, with the remainder of the council voting to in favor of its certification. 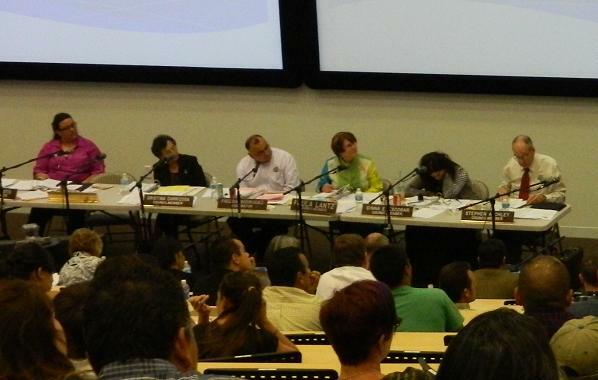 Carrizosa and Rodriguez also opposed the parcel map, with the remaining councilmembers approving it. Carrizosa left the meeting in protest, and missed the vote to approve the conditional use permit, leaving Rodriguez as the only vote oppositional vote. The project was approved. 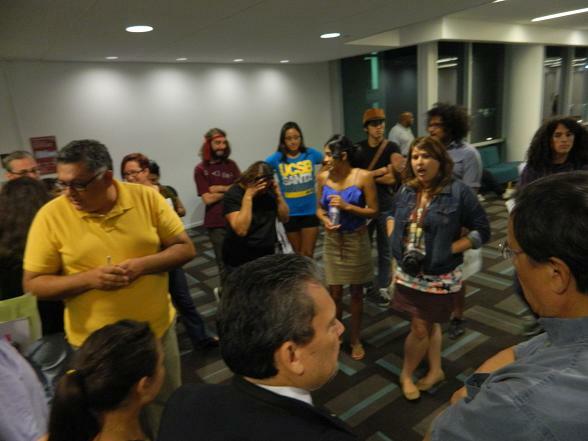 The decision marks an obstacle for the movements for democracy and environmental justice in Pomona and the greater region. Numerous avenues to overcoming the obstacle are being explored, including legal injuctions, demonstrations, and research into allegations of corruption, including suspicions that councilmember Danielle Soto's campaign manager is on Valley Vista's payroll, among others. The issue also raises other issues about the political process in Pomona. Does a single organization, even if composed of numerous groups, have the authority to privately negotiate on behalf of all the residents of the city? Why has One LA changed its name to the "Inland Empire Sponsoring Committee," and what is it sponsoring? Are non-profits in the city "for sale" to corporations making tax-deductible donations to them? Where are the voices of the oppressed in the process, especially when the negotiating organization is composed primarily of white, middle-to upper class elderly church members? Why is the teacher's union supporting the project when there is no guarantee that the workers will have the benefit of union protections? How can Pomona solve the unemployment and poverty problems within its boundaries without creating environmental hazards of which the poorest and most marginalized will bear the brunt? How can we organize in such a way that not only produces concrete victories and changes, but also avoids the pitfalls of NIMBYism and creates a space for consciousness-raising about local and global issues? The community, angered by the trash company's purchase of their democracy as well as the perception that One LA has sold them out for its own short-term benefit, will be seeking answers to these questions as it renews its own organizational process and its pursuit of justice. 3. "Don't Trash Pomona! | Stop the 9th Street Waste Transfer Station." https://www.facebook.com/donttrashpomona. Accessed July 23, 2012. 4. Boys & Girls Club of Pomona Valley. "Our Supporters." http://www.bgcpv.org/about-us/our-supporters/. Accessed Junly 23, 2012. 5. Boys & Girls Club of Pomona Valley. "Board of Directors." http://www.bgcpv.org/faculty/board-of-directors/. Accessed Junly 23, 2012. Ginna Escobar has better things to do than listen to the public and participate in the meeting. In this photo, she reads a text. Who is it from?